The Blend really seems to be working. Please can I order some more..
Libby responded well to the 'Balance' mixture. I was at DCT open Obedience Show today, me and Luke (working sheepdog) won the Novice group ...Thank you for some wonderful stuff that works. I adopted a Patterdale terrier street dog that resembled the Tasmanian Devil when I got him home, agressive, terrified, Hyper not able to concentrate to name a few. After [using] Balance Blend for him, and 9 months of perseverance he's a different dog. We had a successful day at The Royal Suffolk Show. Ruby [horse] rode so well we are so pleased, her behaviour was impeccable ...we came second - so cheers to Balance and Relax. 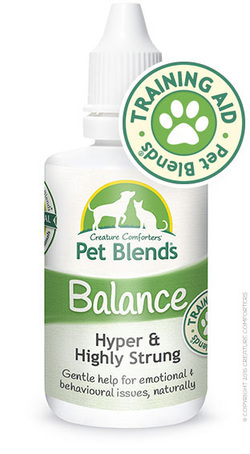 My dog has nearly finished the 'Balance' essence - and I have been very satisfied with the results. Thank the lord It has arrived... Absolutely wonderful stuff! “5 STARS ***** Item received this afternoon, it was very fast, flawless packaging [Aroma Zen]. I ordered it for my dog ​​(Labrador 2 years) has a behavior in the Excess, it is in the presence of other dogs or humans very energetic, he calms down only with difficulty despite a strong education …. no problem for him to swallow doses on a cookie or in the bowl, he does not realize it. I love this product, when my dog has not been on for a while I really notice the difference, so thank you. ORIGINALS OF ALL OUR TESTIMONIALS AND FEEDBACK AVAILABLE TO VIEW UPON REQUEST. As you can see from the feedback above owners find this Blend very helpful. It may not be an instant cure for your pet (this depends on the depth or complexity of their problem), but it should help to gently take the edge of their problems. Please follow the instructions on the label and leaflet for the best outcomes. Please write your own review on the Balance Blend.